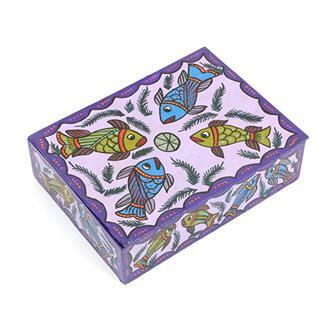 Our collection of beautiful pieces of folk art from around the world includes Mexican Day of The Dead gifts, colourful Mithila painting, tribal inspired items, Peruvian crafts, intricate Buddhist thankas and Indian tapestries. 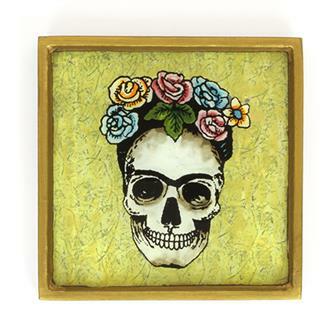 Beautiful Day of the Dead picture featuring a Calavera (skull) with a crown of roses. These delightful little pictures are made by a small family workshop in Peru by painting on mirror which is then sealed into a wooden frame. This type of mirror painting gives each picture a bold satin like finish. 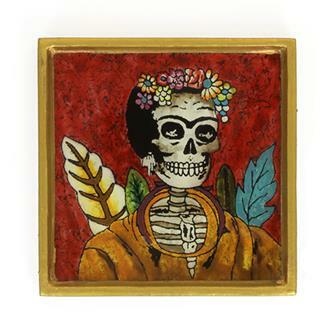 Beautiful Day of the Dead picture featuring a Calavera (skull) lady sitting with a crown of roses. These delightful little pictures are made by a small family workshop in Peru by painting on mirror which is then sealed into a wooden frame. This type of mirror painting gives each picture a bold satin like finish. 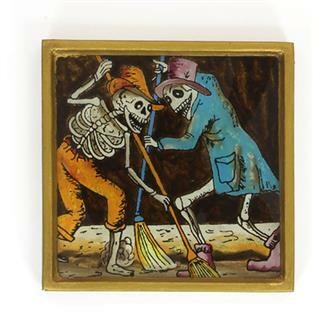 These beautiful Day of the Dead pictures feature a pair of skeleton road sweepers in a Central and South America style first made popular by José Guadalupe Posada. These delightful little pictures are made by a small family workshop in Peru by painting on mirror which is then sealed into a wooden frame. This type of mirror painting gives each picture a bold satin-like finish. 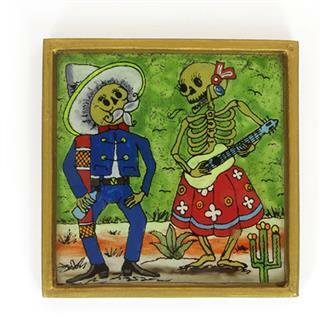 These beautiful Day of the Dead pictures feature a a pair of Calavera lovers in a famous Central and South America style. Each of these delightful little pictures are made by a small family workshop in Peru by painting on mirror which is then sealed into a wooden frame. This type of mirror painting gives each picture a bold satin-like finish. These absolutely stunning works of folk art are hand produced in Peru by a small specialist workshop. 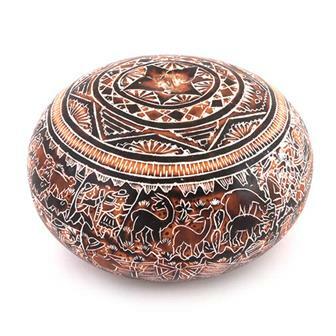 These styles feature highly detailed etchings and very intricate scenes of rural life in Peru. Around the outside there are farming scenes with various animals. 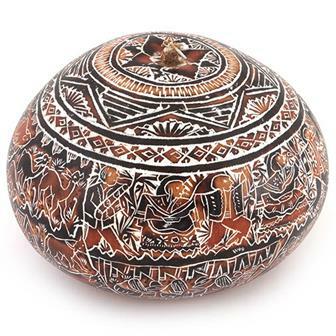 These absolutely stunning works of folk art are hand produced in Peru by a small specialist workshop. These styles feature highly detailed etchings and intricate scenes of rural life in Peru. Around the outside there are farming scenes with various animals. 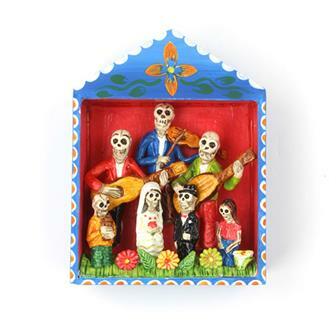 Handmade in Peru, these wonderful little scenes are known as retablos. They are a popular form of folk art in Central and South America and they often depict religious themes and scenes of traditional life. 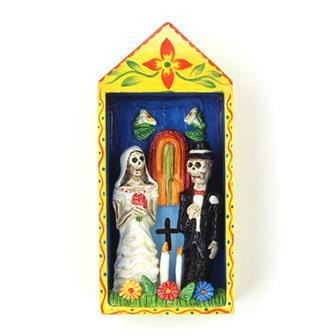 This version shows a bride and groom represented as skeletons or calaveras. You can read more about these fascinating items on our blog here. Handmade in Peru, these wonderful little scenes are known as retablos. They are a popular form of folk art in Central and South America and they often depict religious themes and scenes of traditional life. You can read more about these fascinating items on our blog here. 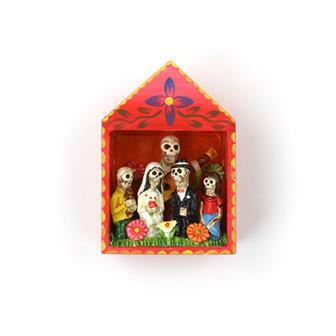 Handmade in Peru, these wonderful little scenes are known as retablos. They are a popular form of folk art in Central and South America and they often depict religious themes and scenes of traditional life. 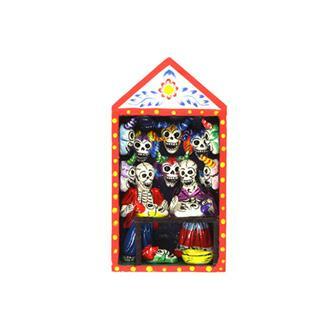 This version shows a mask shop with two mask artists represented as skeletons or calaveras. 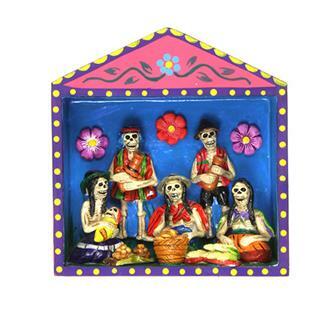 This style is commonly seen across Latin America, particularly around the Day of The Dead festival. You can read more about these fascinating items on our blog here. Handmade in Peru, these wonderful little scenes are known as retablos. They are a popular form of folk art in Central and South America and they often depict religious themes and scenes of traditional life. This version shows a market scene with skeletons or calaveras, a common style in Latin America that is most frequently seen around the Day of The Dead festival. You can read more about these fascinating items on our blog here. 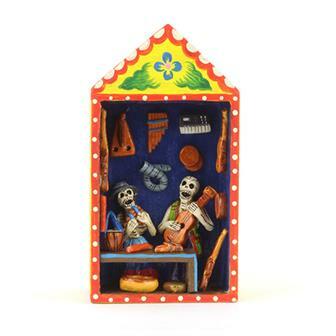 Handmade in Peru, these wonderful little scenes are known as retablos. They are a popular form of folk art in Central and South America and they often depict religious themes and scenes of traditional life. 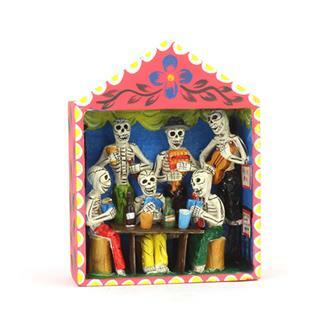 This version shows a wedding scene with the bride and groom, guests and band represented as skeletons or calaveras. You can read more about these fascinating items on our blog here. 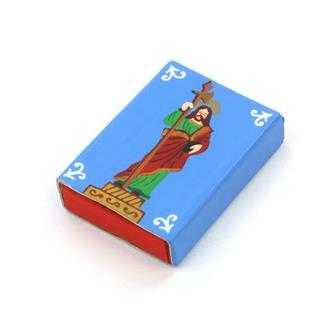 This style of devotional artwork, known as Retablo in Spanish, features intricate hand paintings of Saint Jude on the outside of each matchbox and a ceramic figure of the Saint on the inside. 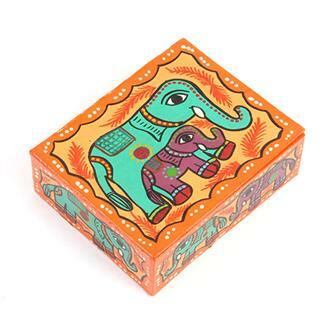 These wonderful boxes are carefully hand painted in Madhyapur Thimi, just outside Kathmandu, Nepal. Each piece is made from thick cardboard and is decorated in the traditional brightly coloured painting style from Mithila region. Read more about these fascinating pieces and their creators here. These very special pieces of wall art are carefully hand painted in Madhyapur Thimi, just outside Kathmandu, Nepal. 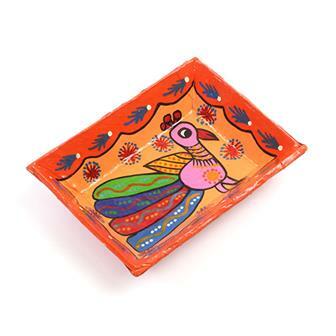 Each piece is made from thick cardboard and is decorated in the traditional brightly coloured painting style from Mithila region. Read more about these fascinating pieces and their creators here.